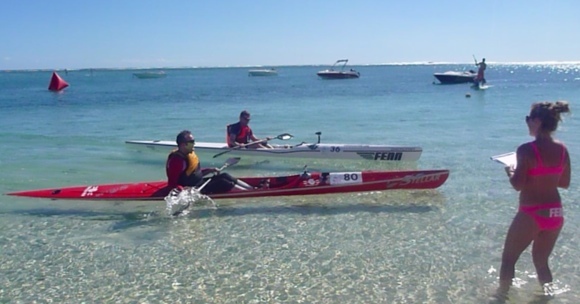 It’s been seven months since I first entertained the idea of trying to participate in the Mauritius Island Shamaal – seven months of training, dieting, learning to paddle a surfski and all under a cloud of uncertainty in my own ability to achieve the goal. As I stood on Sancho beach, surrounded by ninety paddlers (including the world’s best), the realisation that the moment was upon me was both tense and exhilarating. Nat and I made the final preparations for our surfskis, carefully laid out in order on the beach. As the bottom seed, my boat was first in the line-up, or in pole position, depending on how you looked at it. 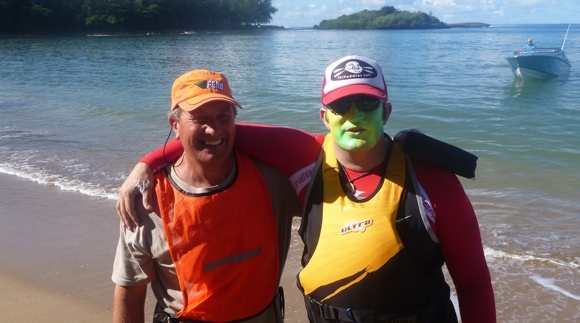 With hydration systems set-up, cameras attached, safety gear at the ready, all was set for the start of the 2012 Mauritius Ocean Classic. I’d come prepared for action too, having removed my moustache and painted my face in the green and gold zinc of Aussie sportsmen of old. During the pre-race briefing, Race Director Anton Erasmus dragged me up before the crowd as an example of the crazy Aussies there to take on the bigger South African contingent. 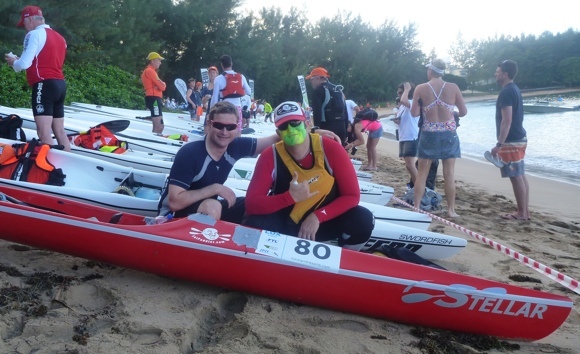 It was an example of the incredible atmosphere of this unque event, with everyday paddlers rubbing shoulders with world champions, and all sharing in the joke and comraderie of the challenge of Mauritius. 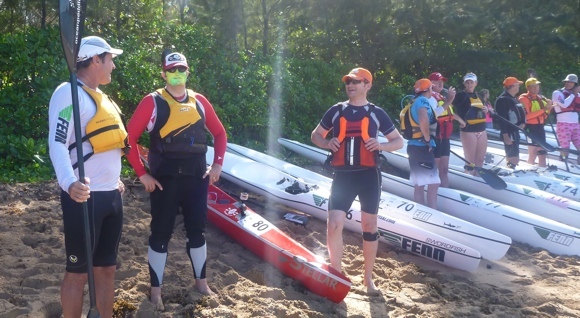 As the final minutes counted down, Nat and I found ourselves chatting with surfski downwind legend Dean Gardiner about the conditions for the race. The trade winds anticipated for the race earlier in the week had disappeared, replaced with a gentle puff of wind instead. The day was hot, wind-less, and with a south-westerly swell sitting a little under 3 metres – not the best conditions for downwind racing, and most of the competitors were bitching about the hard, hot slog ahead. Deano suddenly interrupted our conversation to inform us the race had actually started! 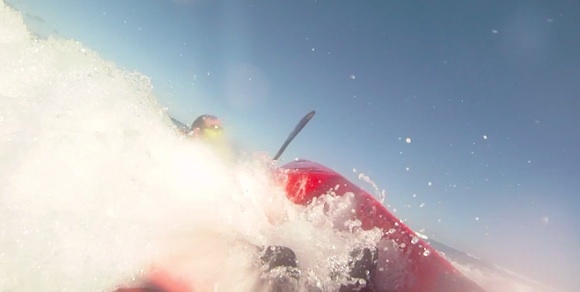 We jumped back to our boats as competitors dragged their skis to the water, jumping in and paddling out to sea. Nat and I dragged our skis out as well, a little behind most, and then shakily jumped aboard. Around us, most paddlers were steaming out into the small bay, with one or two falling off their skis (yes Adam, I’m looking at you! ), but Nat and I somehow managed to slowly but surely get underway. The Island Shamaal was on. The rules of Shamaal are simple – start at the start, finish at the finish, how you get there is up to you. 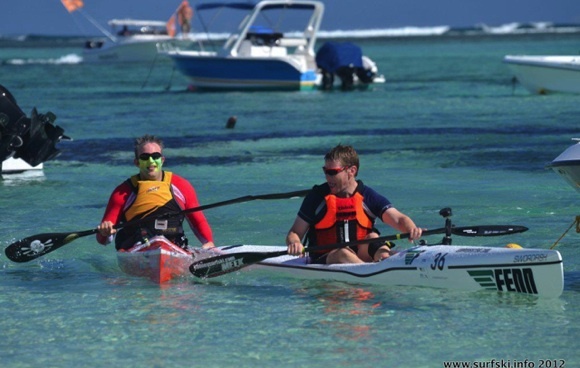 Most paddlers head outside the reef to the ocean, take advantage of the winds to crank their surfskis up on the downwind conditions, then pick a line through the treacherous Le Morne pass and hopefully surf their way through it before slogging out the final 2kms against the current inside the reef to the finish. The alternative is to head out to sea, then cut back inside the reef at an earlier pass, and then make use of both the current and the flat water inside the reef to build speed. Nat and FP pose by the boats down on the beach. Not long until race time. Because of the light winds, there was the possibility some paddlers may opt to head back inside the reef, but for Nat and I the option wasn’t one we wanted to take. 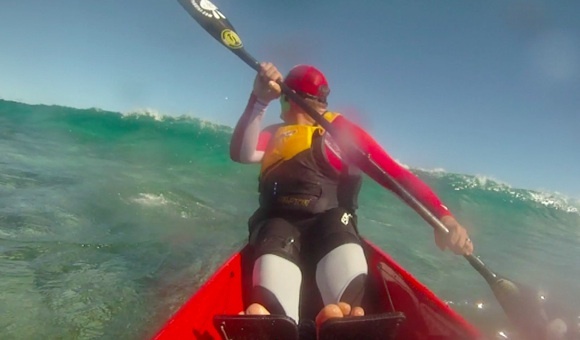 We’d come to take on the ocean, and paddling inside the reef felt like cheating. We planned to head up the coast at sea, swing wide at Le Morne and then take the relatively safe line through the final pass to the finish. At the start, we would have to head out to sea and decide the right point to turn west outside the reef. Despite the wind, there were still 3 metre slabs of ocean rolling into the reef at the start and deciding when to risk the turn was interesting. With Nat ahead of me, I watched a monster jack up in front of him, at least three lengths of his ski high, and his mad scramble to get over the top of it before it flipped him back into the reef. He later comfirmed he’d been close to soiling himself during the experience. Having a chat to Deano. Now, is there something else we should be thinking about?? 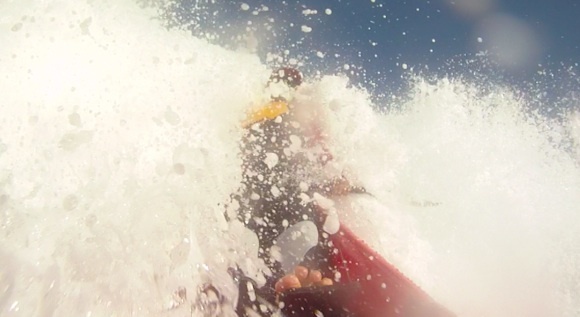 I was nervous of the big breakers too and kept my line fairly wide and safe. Nat had taken a sharper line early, then changed to head to deeper waters, whilst I’d gone wide at the start but then cut in earlier, so that we ended up paddling parallel to each other along the reef, with me closer to the break line. Once out on the ocean, the slabs of water kept coming side-on to us, but with no breaking face to worry about, we simple rode up and over them as we made our way. Several kilometres in we’d lost sight of most of the other paddlers. There were little runs to grab but we made use of the ones we could find and kept a steady 12km/hr pace up the coast. We weren’t really being challenged but we wanted to conserve energy for what we suspected lay ahead – stiffer winds and steeper waves and runs closer to Le Morne. We even got to enjoy a large pod of dolphins rush up to us head on, before splitting off to the side of us to pass. In all, we were having a lovely cruise up the coast in gentle conditions with plenty of time to take in the magnificent southern coastline of Mauritius. As the race went on, the wind started to pick up and we started to string runners together. My fitness wasn’t anywhere near where I wanted it to be, so maintaining a solid pace was difficult for me. But I do have great explosive pace when I need it, which I was using to my advantage to jump onto and string together runs. Nat was doing the same 50 metres away from me, and together we yelled and screamed as we’d lock onto runs and double our speed, pushed by the wind-waves behind us. Closer to Le Morne the waves started to build in size and steepness, and before long enormous mountainous waves started to roll in. The south reef-break of the pass sticks out a good two kilometres to sea and two days before we’d miscalculated where it ended and made a desperate dash out to sea to avoid being crushed on the reef itself. We thought this time around we’d been more conservative, but again we miscalculated it and found ourselves in amongst mountainous waves with steep faces, cutting sideways across their faces to get back out to sea. 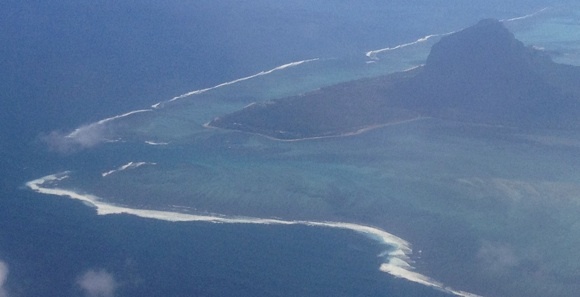 The Le Morne pass, as taken from the air. That white stuff is huge surf breaking on reef. We thought we’d finally made it and started to make our line into the pass when one of the official race-boats came out to where we were. Race Director Anton yelled out to us to head back to sea and take a wider arc into the channel, as we were heading right into the impact zone. Turning around I found myself facing waves bigger than houses, their lips starting to crumble and Nat desperately paddling to get back over them. Gritting my teeth and putting my head down, I dug in with my paddles and fired myself over a couple of these mountains before making the wide arc back into the channel itself. Nat was ahead of me now by 100 metres or so and was motoring into the Le Morne pass. As I followed I cast a glance to my right and marvelled at the incredible sight of line after line of perfect enormous tubes, peeling off to the left before belting onto the reef beyond. Captivated by the sight, I decided to bugger the race and turn in for a quick surf off the end of the line, but my attention was drawn back by Anton’s thick South African accent yelling at me to turn back and get on with the race. Begrudgingly, I did so. Nat and I continued our paddle into the pass but both of use had trouble seeing the actual line through, with a second line of breakers now up ahead. I had no idea which line to take but watched Nat head straight into the surf zone, ready to catch a wave across the coral. I watched with delight as a nice fat wave rolled in, picked up Nat’s ski and literally threw it up and then over into the froth. I was laughing so hard at Nat’s dumping that I couldn’t even paddle. Then, after a few seconds of doing so, I turned to see if anything was behind me, and there it was – a lovely big wave jacking up to break right on top of me. It was almost surreal, as in slow-motion I calculated my ability to paddle out in time, realising I was doomed, before lying back on the deck and bracing for the inevitable impact. Errr, I don’t think this is going to end well…. The wave hit the back of me so hard it practically knocked the wind out of me, picking up myself and surfski and dumping us on the coral below. I’d removed my leash not long before but managed to hook my feet into the foot brace and, as the wall of froth side-surfed the ski upside down across the reef, I was dragged along behind the ski on my back underwater for some 300 metres. I can distinctly remember being calm as I rushed by, occassionally bouncing off the reef in my PFD and almost smiling at the ride I was getting underwater. When it finally stopped, I came to the surface, took a big gasp of air and scambled about gathering my hat, paddle and ski before the next wave hit. I got hit by about three more walls of froth, almost losing the ski and eventually losing my hat, hydration setup and a few other bits and pieces. 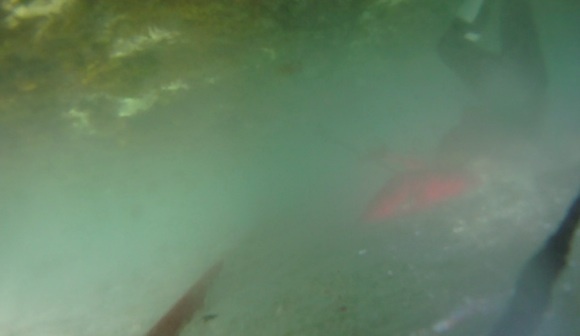 After a few embarrassing attempts I was able to scramble back onboard the ski, get some momentum going again and then catch a small runner across the remainder of the surf zone and into the calmer water inside the reef. FP bracing himself for the inevitable impact…. Batten down the hatches, this is going to get rough! Anton cruised up alongside me in the race-boat and was practically crying with laughter, giving me a cheer when he could see me smiling and laughing at what had happened. I figured Nat was a way ahead of me but Anton informed me he was behind a fair way and had had to be rescued (he’d lost his ski in the maelstrom). I stopped to wait but Anton yelled at me to keep going, not wanting to give me any excuses to stop and rest. So I kept on paddling at a slow easy pace as Nat, powering along behind me, finally caught up. Both laughing, we paddled the final two kilometres in the calm inside the reef, laughing and talking though what had happened. 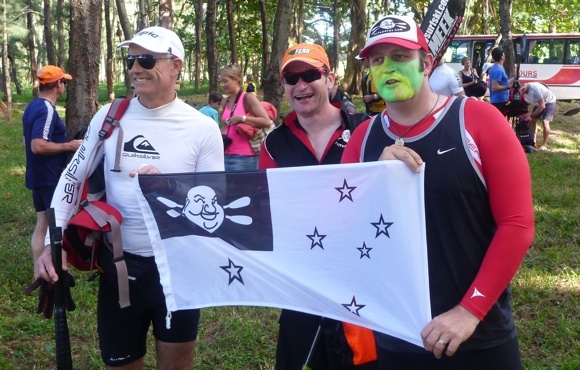 To the cheers of the small crowd gathered, together we crossed the line to finish the Mauritius Island Shamaal. The race Nat and I had engaged in was a far cry from the real race at the front of the pack between the best in the sport. The currently ranked #1 Dawid Mocke had won the event, with Aussie Jeremy Cotter in second place, Hank MGregor in third, Matt Bouman in fourth and Barry Lewin in 5th. In the ladies division Aussie Ruth Highman had held off challenges from Angie Mouden (France) and Kerry Louw (South Africa) to win the race. Mauritius Ocean Classic 2012 Men’s Winner, Dawid Mocke with Miss Brasil. To the Victor! 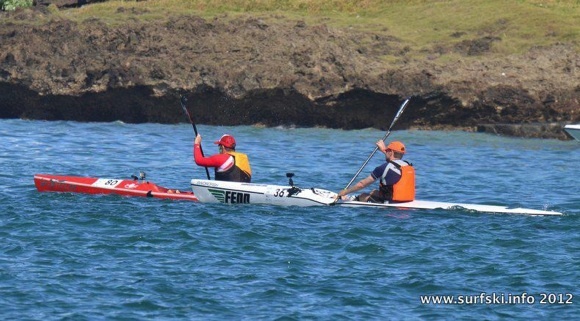 Special thanks to Rob Mousley and www.surfski.info for use of the photos. 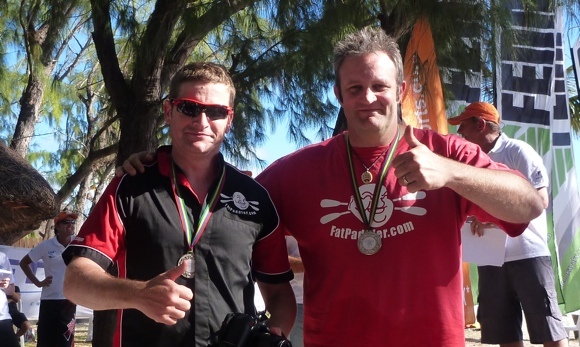 Read the Surfski.info Official Race Report for full details of the fight up front for the win. Nat and FP with their Mauritius Ocean Classic medals. We made it! Well done FP, I always believed in you. No, wait, it was Santa Claus I believed in — you were the fat, friendly bloke I *didn’t* believe in. But you’ve proved yourself capable of amazing things mate, and you should bask in the satisfaction — you completed the Mauritius Ocean Classic, a bloody world championship event, on a skinny bloody bit of plastic you couldn’t even stay up on in calm water a year ago. More important than all of that, you’ve done it with good grace, a smile and a laugh when you hit setbacks, went in, and at the start and finish of every dawn paddle. Sean – Congratulations young man; you continue to inspire me. Well done, Sean and Nat, what a great inspiration..I’ve really enjoyed seeing your grit and determination in getting up to speed to complete this race…very proud of you guys !!! Well done fella’s, not only for the race itself but for setting a goal, doing the work and realising your potential, a great encouragement to others looking to live life a little bigger and better than the daily grind! Great story Sean… It was great to meet you & Nat & Josh… Drinking a cold one out of the beer mug as I type this! Keep up the good work, FP! You’re a real inspiration to the rest of us. 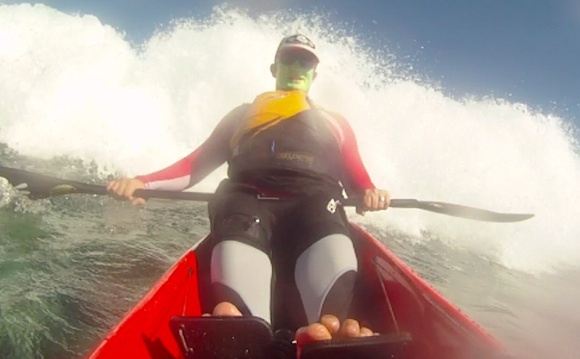 Guys, Inspirational – I have just started paddling and am a little behind you two! looking forward to Nat’s review of the swordfish. You lucky bastards. I am at the ski level of when you first got on your ski, Sean, and all I can say is you’re living the dream. Might catch up with you on the water one day. Sean, Great work and good on you and Nat. Well done ! I don’t know….Seem to remember a couple of guys heading to bed early when the serious drinking started…….